In 2014, Boulder’s resident population is about 107,000 people. Its daytime population swells by 60,000 more people who are commuting into Boulder for their jobs bringing the daytime population to about 167,000. Boulder got to be this size, rather than bigger, because of a decades-long effort to limit its size and to maintain its small town feel. That, its beautiful mountain backdrop, and the University of Colorado have made it an internationally sought-after place to live and to locate jobs. 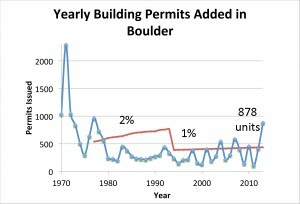 In 2014, it is apparent that a housing binge (2% more building permits in 2013) is overtaking Boulder in a way that will destroy its appeal. This brief history of Boulder’s efforts to control growth, successful and unsuccessful, is intended to aid those attempting to fashion a revised growth management system. 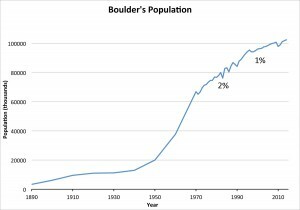 The graph shows slow Boulder growth until about 1950, followed by explosive growth through 1970. The population tripled by 1970. This was the stimulus that produced strong citizen activism that has limited excessive growth since then, or at least until the past few years. 1959 Blue Line. After the City Council scheduled an election for bonds to expand a water treatment plant, citizens asked the Council to create a Blue Line at 5750 ft. elevation beyond which water lines would not be extended. Citizens petitioned requiring the Council to put the item on the ballot. On July 21, 1959, the voters approved the Blue Line and defeated the water plant expansion. 1961 NCAR. Boulder voters showed their flexibility with 79% voting to approve the construction of the National Center for Atmospheric Research above the Blue Line with 90% of its land being preserved and the Mesa trail protected. 1963 Boulder Broadmoor. Boulder voters approved a $105,000 bond issue to stop the construction of a Boulder Broadmoor on the Enchanted Mesa with citizen contributions adding $10,000 more. 1965 Spokes of the Wheel. City Manager Robert Turner proposed to extend water to outlying portions of the City, but Boulder voters rejected it. While IBM built its plant in 1965, an attempt to extend water to Marshall Road in South Boulder, led the voters to reject the spokes of the wheel concept. 1967 Open Space. With citizen advocacy, City Manager Ted Tedesco and Council put a one-cent sales tax on the ballot with 40% going to open space and 60% to transportation. The open space was a green belt to limit overdevelopment and protect the environment. It was approved by 61% of the voters and became the nation’s first voter-approved sales tax for open space. 1971 Height limitation. After a proposal for a 17-story building near the present Arapahoe Village shopping center citizens pressured City Council into adopting an ordinance limiting buildings to 140 feet. Led by Ruth Wright, signatures were gathered to force a 55 foot height limit onto the ballot. The height was chosen to be the size of a mature tree in Boulder. The ballot item passed. Wright went on to become the Minority Leader of the Colorado House. 1976 Danish Plan. Council member Paul Danish, a hippie who had earlier been President of the CU student body joined forces with a young lawyer Alan E. Schwartz. Together they wrote a growth management plan for Boulder. After being rejected by Council, citizens petitioned it onto the ballot and it passed. One of the first, and most widely emulated community growth management plans in the country, it limited growth to 2% per year and had a five-year sunset clause. Modeled after a Petaluma, CA, ordinance it survived legal challenges. 1980 Systems Development Corporation. A research facility on 475 acres south of Eldorado Springs Drive would have been on land designated as open space and would have required the extension of public utilities. Council condemned the land and spent $1.5 million to acquire it. 1995 Slow Growth! Citizens petitioned a ballot item the Council refused to put on the ballot in 1994. It would have limited growth in commercial and industrial square footage to 1%. One reason it was rejected by the voters was a weaker competing Council ordinance that could be overturned by Council. It led to a comprehensive rezoning in 1997. Late 90s Jobs/Population study. A citizen’s committee was appointed and dominated by developers having an obvious vested interest. It led to paralysis and no productive output. It did reflect the dominance of business by Council-supported construction of more housing without dealing with excess jobs and in-commuting. The staff acknowledged in 1997 that “the city will continue … job growth that exceeds housing growth.” They got that right! 2000 Exemptions added to Growth Management System. A seemingly pro-development Council added several devastating exemptions including all housing units in certain business zones and on any property rezoned to residential. A driving force was to make life easier for developers and to save City staff costs for reviews. 2006 Annexation by Vote. In an effort to gain choice on growth through annexations, citizens petitioned for a vote that would require a citizen vote to allow any annexation of more than five acres. Unfortunately the title of the measure was misunderstood by some voters who thought the vote would make annexation easier rather than harder. 2013 Housing binge. With the recovery of the national economy, the number of building permits is about 2% growth with almost all of it coming from exemptions. The 1% limit in the preamble to the Growth Management System has become meaningless. Even higher growth is expected in 2014. The building permits issued in 2013 will lead to about a 2200 person increase in population. Growth of the University of Colorado. To be expanded. The University has never provided sufficient housing as it freely adds students, putting pressure on the availability and cost of housing.